After bad weather forced the closure during two days of the ski resort of Sierra Nevada (Granada), on Dec. 3rd, with glorious sunshine and lots of powder snow were open 50,9 kilometers of ski slopes, ten more than initially expected. 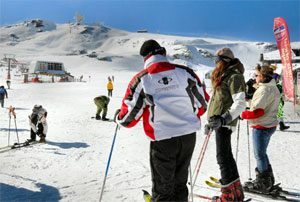 Except for the same period in 2008, when came into service 74.7 km of slopes, Sierra Nevada had never offered such a ski area in the first week of December, according Cetursa, the public company that manages the winter resort. This past weekend, a total of ten lifts (a gondola, seven chairlifts and two conveyor belts) gave access to the ski area, which can increase due the possibility of new snowfall expected over the coming days. One of the most “exotic” attractions is the night skiing to be held on Fridays and Saturdays from Christmas onwards. The opening of slopes at Veleta allows the station to offer most of its vertical drop, with 1,100 meters to reach across the slope of El Rio until the resort of Pradollano. Cetusa has said that this season, opened one week in advance in comparison to last year, will continue until the last weekend of April. Usually Sierra Nevada is the Spanish resort that closes latest. Sierra Nevada is basing its offer on both the number of kilometers of slopes and their quality. But as well the resort is outstanding in what has been called “après-ski”, i.e. tourism and leisure activities that can be carried out in the vicinity of Sierra Nevada. The resort Pradollano is half an hour’s drive from Granada, a cultural and culinary destination of the first order, and 40 minutes from Motril, the only tropical coast on the European continent, which is suitable for bathing and activities nautical during many winter months. Malaga and the Costa del Sol are only 120 km away, thus Sierra Nevada is as well a great option for a day trip to the snow.